This was recorded in May 2002 and originally released as an SACD by First Impression Music on M045. Cala has picked it up, dressed it down and reissued it in its accustomed livery. 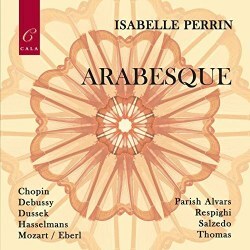 Internationally admired Isabelle Perrin joined the San Francisco Symphony Orchestra and later on the Orchestre National de France as co-principal harpist, a position she held for 25 years. She has also made numerous recordings and done much to further knowledge of the harp. She has numerous publications to her name and is a visiting professor at prestigious institutions. As she points out in her introductory programme note, her choice of repertory was meant to be as eclectic as possible, stylistically and in terms of chronology. It is, in effect, a kind of simulacrum of one of her solo recitals, with a preponderance of piano originals arranged for the harp. Alphonse Hasselmans, who lived until 1912 and taught Carlos Salzedo, who is also represented on the disc, contributes his rivulet study La Source, a crystalline piece of nature depiction, whose arpeggios depict the stream’s unimpeded progress, a progress helped in no small degree by the clarity of articulation, and forward projection, of the soloist. Anton Eberl was one of Mozart’s pupils and the harpist John Thomas – yes, he is also to be heard later in the recital - conjoined the pupil’s Aria con variazione with the Master’s Rondo pastoral to form a compound piece of great charm. Chopin’s Raindrop Prelude is an example of the co-option of the nineteenth-century pianistic romantic tradition. Pastoral love, set in the context of running water, which is a cue for more aquatic arpeggios, infuse the traditional Chinese piece Flowing Stream, which revisits the musical trope explored by Hasselmans though in a way that is definably different. Sophia Corri-Dussek’s Sonata in C minor had the misfortunate to be attributed to her husband Johann Ladislav Dussek – probably not for reasons of prejudice, but more, perhaps, because her works were published simply under the surname Dussek. In any case this elegant classical piece has a doleful slow section, and is full of warmth of texture. Salzedo’s Chanson dans la nuit has supple rhythm, refractive colour, rich glissandi and a nocturnal firefly element – a kind of strumming by the fireside, with some flamenco-like stamps too. We also hear John Thomas’s lovely, bardic Minstrel’s Adieu to his Native Land, its passionate melancholy splendidly conveyed, the operatic, virtuosic though not fast Serenade by Elias Parish Alvars and Respighi’s beautifully limpid Siciliana. The two best known works come at the end, Debussy’s Arabesque and Danse sacrée et profane, in which Perrin is joined by the Northwest Sinfonia under Christophe Chagnard. This is a suitably evocative way to end a recital, though the orchestral accompaniment comes as something of a surprise after the run of solo pieces. This is an attractive programme and its revival, being so compellingly played, is certainly worthwhile.